Welcome to River Pointe, the perfect escape from your busy life in Pigeon Forge, Tennessee. River Pointe offers two to four-bedroom chalets to accommodate up to eight adults comfortably. Amenities include outdoor bbq grill, large decks, washer and dryer and a hot tub. River Pointe is located just a half mile from the heart of downtown Pigeon Forge. 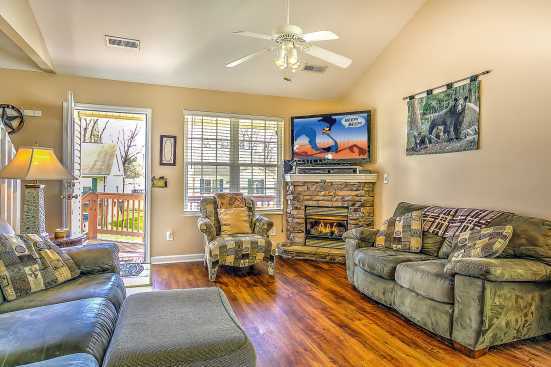 Imagine waking up in a quiet chalet, having your morning coffee, and heading just a minute up the road to explore all the attractions of Pigeon Forge. When you are ready to venture out of your chalet consider walking or driving just a half mile and exploring downtown Pigeon Forge. Pigeon Forge is home to many great attractions such as boutique retail locations, go-kart tracks, Dollywood Amusement Park, multiple dinners and show locations, and waterparks. If your more of an outdoor adventure take a short drive to the world-renowned Smoky Mountain National Park. The park boasts incredible mountaintop views as well as hidden waterfalls and a ton of local wildlife. Have you seen the leaves in the Smokies change colors? It is a truly a unique experience that you won’t soon forget! SmokyMountainsByOwners.com is the only site to plan and book your Pigeon Forge location. Take the family out for an unforgettable day of go-kart racing and riding roller coasters or venture into the famous Smoky Mountains for an unforgettable hike through nature.